Studies have shown that having one alcoholic drink a day reduces a woman's risk for heart disease better than drinking less than that or nothing at all. This has never made sense to me. Diabetes, inflammation, and ethanol toxicity are just a few situations linked to alcohol consumption that could increase your risk of heart disease. But I've seen study after study that shows the health benefits of drinking. Now, a Swedish study published in the journal Alcohol has come up with an explanation. One drink a day may indeed reduce the risk for heart disease – but only in the 15% of the population who have a particular gene. The other 85% of people are not protected by alcohol. Researchers at Sahlgrenska Academy at the University of Gothenburg in Sweden conducted this study to determine if moderate drinking did indeed decrease your risk of coronary heart disease. The researchers defined "moderate" as up to one drink a day for women and two drinks a day for men. They found that the drinking did have a positive effect, but only for people who had a particular genotype of the cholesteryl ester transfer protein (CETP) polymorphism. The study then looked specifically at people with the CETP TaqlB polymorphism. The study included 618 patients under the age of 75. They came from three regional hospitals and had been admitted for acute coronary syndrome and received diagnoses of myocardial infarction or unstable angina. Of the 618, there were 453 men and 165 women. While 209 of the men and 83 of the women were experiencing acute myocardial infarction or unstable angina for the first time, the other 323 participants had previously diagnosed cardiac issues that had been exacerbated. The participants, along with 2,921 healthy members of the control group, filled out questionnaires about their environmental and lifestyle risk factors, including their frequency and amount of alcohol consumption. The researchers tested them to determine if they had the CETP TaqlB genotype, as well as whether they carried the B1 or B2 alleles of the genotype. They found that moderate drinking did not have a protective effect, unless it occurred in conjunction with the presence of the CETP TaqlB genotype. This genotype was similarly distributed among males and females in both the participant group and the control group. They also found that people with the B2 allele had an overall lower risk of coronary heart disease, and they had a significantly lower risk when combined with moderate alcohol consumption. This effect was more noticeable in the group of participants who were experiencing cardiac issues for the first time. Professor Lauren Lissner concludes, "Moderate drinking alone does not have a strong protective effect. Nor does this particular genotype. But the combination of the two appears to reduce the risk of coronary heart disease significantly." The study authors think that the combination of the CETP genotype and alcohol may affect HDL (good) cholesterol in a beneficial way. 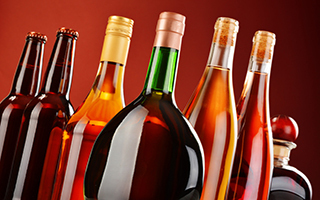 They also hypothesize that alcohol's antioxidants contribute to the protective effects. But they still aren't entirely sure what makes the combination so effective. Professor Dag Thelle, Professor Emeritus at Sahlgrenska Academy, explains, "Our study represents a step in the right direction, but a lot more research is needed. Assuming that we are able to describe these mechanisms, it may be a simple matter one day to perform genetic testing and determine whether someone belongs to the lucky 15%. That would be useful to know when offering advice on healthy alcohol consumption. But the most important thing is to identify new means of using the body's resources to prevent coronary heart disease." It may take some time before such a test is available. If you want to prevent cardiovascular disease today, drinking isn't the surest way to do it. Instead, I suggest you try Circutol. It's a much better, safer alternative to alcohol. If you want to enjoy one drink a day, that's fine. But don't depend on it to protect your heart.